"Passing through your wonderful mountains and canyons I realize that this state is going to be more and more the playground for the whole republic... You will see this the real Switzerland of America." Colorado is the highest state and has more mountains reaching 14,000 feet than any other state. "Grand Mesa", the world's largest flat-top plateau is also found in Colorado. Her mountain scenery is some of the most beautiful and dramatic in the United States and Colorado is a center for vacationers taking advantage of the pleasant summer climate and the ample supplies of powdered snow in the winter. The Rocky Mountain State is a leader in manufacturing of scientific and medical instruments and is also a major agricultural and mining state. Its gold and silver mining boom days are well known. Mrs. J. Brown, socialite wife of a Colorado mining tycoon was immortalized in the Broadway Musical, "The Unsinkable Molly Brown" so called after she survived the sinking of the ocean liner "Titanic". Her home in Denver has been maintained as a museum. Soon after gold was discovered near Denver, the region around Pikes Peak became the Colorado Territory. Other names, such as Colona, Jefferson, Osage and even Idaho, were suggested and discarded in favor of Colorado, Spanish for "red" in reference to the color of the water of the Colorado River. Colorado is nicknamed the Centennial State because it entered the union in 1876, 100 years after the signing of the Declaration of Independence. This nickname is a reference to the quantities of silver that have been mined in Colorado. 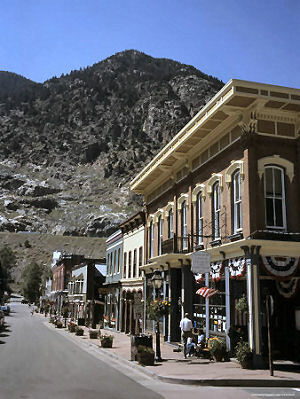 Leadville became one of the world's greatest mining camps in 1878. This nickname came about because of the large quantities of lead that were mined in Colorado. This old nickname referred to the large herds of bison that once roamed the Colorado plains. Colorado, along with other mountainous states, has been referred to as the Switzerland of America for its elevation, its majestic mountains and natural beauty. This nickname is similar in spirit to the one above and is in reference to Colorado as the state with the highest average elevation and its towering mountains. People who live in or come from Colorado are referred to as Coloradans. In days gone by, Coloradans were given nicknames that aligned with certain characteristics of the people of the times. One might have heard Coloradans called Silverines, a reference to the great silver mines and wealth in the state, or Rovers, characterizing the settlers that arrived in the state during the gold rushes when "Pikes Peak or Bust" became a common slogan. Coloradans have also been referred to as Centennials after the state's most common nickname. The third commemorative quarter-dollar coin released in 2006 honors Colorado, and is the 38th coin in the United States Mint's 50 State Quarters® Program. The Colorado quarter depicts a sweeping view of the state's rugged Rocky Mountains with evergreen trees and a banner carrying the inscription "Colorful Colorado." The coin also bears the inscriptions "Colorado" and "1876." Colorado was admitted into the Union on August 1, 1876, becoming our Nation's 38th state. With statehood gained less than one month after the 100th anniversary of the signing of the Declaration of Independence, Colorado is nicknamed the "Centennial State." The Colorado Commemorative Quarter Advisory Commission was formed by an Executive Order issued by Governor Bill Owens. Colorado First Lady Frances Owens served as Commission Chair, and design narratives were accepted from citizens. From more than 1,500 submissions accepted by the Commission, five concepts were forwarded to the United States Mint. The sculptor-engravers of the United States Mint and artists in the United States Mint's Artistic Infusion Program developed the candidate designs from the narratives provided, and the designs were returned to Colorado in May 2005. On May 31, 2005, Governor Owens announced "Colorful Colorado" as his recommendation for the Colorado commemorative quarter-dollar. The Department of the Treasury approved the design on July 20, 2005. The four other design concepts considered during the final selection process were "Mesa Verde," featuring Mesa Verde National Park with cliff dwellings; "10th Mountain Division Birthplace," depicting a soldier/skier of the famed United States Army Division that originated in Colorado; "The Centennial State," which features a stylized letter "C" entwined with a mountain columbine flower; and the Rocky Mountains and "Pikes Peak," featuring the gold rush slogan "Pikes Peak or Bust" and a prospector's pick and shovel. 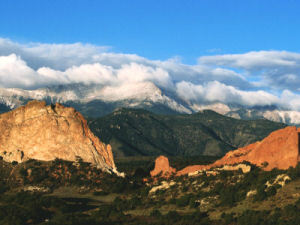 Garden of the Gods: The website of the Garden of the Gods Visitor and Nature Center in Colorado Springs, Coloardo. Georgetown, Colorado: The website of the Town of Georgetown, Colorado. Colorado (From Sea to Shining Sea) , by Amy Miller. 80 pages. Publisher: Scholastic Library Publishing (2002) Reading level: Grades 3-5. Presents information about Colorado's people, geography, history, landmarks, natural resources, government, state capitol, towns and cities, and more. Colorado (World Almanac Library of the States) , by Megan Elias. 48 pages. Gareth Stevens Publishing (July 2002) Reading level: Grades 4-6. Filled with the most up-to-date information, including the latest Census results. Full-color photos bring to life the story of Colorado. In addition to an in-depth factual profile of Colorado in the form of a state Almanac, this book offers fascinating and lively discussions of the state's history, people, geography, government, economy, culture, and lifestyles. A section on Notable People, a calendar of events, and enough primary source documents, time lines, maps, and other tools to make this unquestionably the best young adult reference material on the USA available anywhere. Roadside History of Colorado , by Candy Moulton. 296 pages. Mountain Press Publishing Company (May 1, 2006) Colorado's roads wind through country that is steeped in history, sometimes tracing routes with a history of their own, from the Santa Fe Trail to the Million Dollar Highway. But no matter where you roam in this beautiful state, Roadside History of Colorado can guide you. In this long-awaited volume, award-winning history writer Candy Moulton escorts readers through ancient pueblos, perilous trails, mining boomtowns, and modern ski resorts. Roadside History of Colorado is divided into geographical-historical areas, making it easy to explore the state region by region. Mesmerizing tales of adventure and tragedy-including cannibalism on the "Starvation Trail," the infamous Sand Creek Massacre, the jailing of Mother Jones, and the Big Thompson River flood of 1976-will thrill both Coloradans and visitors. Numerous historical photographs and maps enhance this entertaining and handy guide to the history of the Centennial State. The Colorado Almanac: Facts about Colorado , by Thomas J. Noel. 232 pages. Westwinds Press (October 1, 2001) Whether you are a visitor to, or a resident of, the Centennial State, The Colorado Almanac is a mile-high must-read. In this newest addition to our state almanac series, The Colorado Almanac is packed full of interesting factoids and fascinating bits on the geography, economy, history, and people of this beautiful state. This handy, portable volume offers an unending store of entertainment for those curious about Colorado. Numerous photographs, charts, maps, illustrations, and up-to-date information make this book an indispensable reference. What is the highest point in the highest state? Where are the most dangerous avalanches? What was so peculiar about Colorado's 1905 gubernatorial election? Where can you go to experience a real dinosaur dig? Where is the best place to see the legendary jackalope? Find out this, and more. Thomas J. Noel is a noted Colorado historian and author of several books on Colorado, including Denver: Mining Camp to Metropolis , coauthored with Stephen C. Leonard.